Mobile you can rely on! 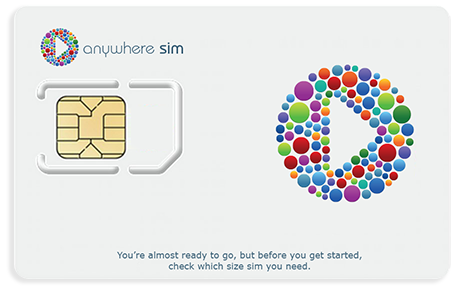 Anywhere Sim is the UK’s leading provider of multi network mobile. Our sim lets you roam seamlessly across multiple mobile networks, dramatically improving mobile coverage wherever you are. Anywhere Sim is truly mobile you can rely on! Imagine if you could access any available mobile network, not just one? Well, now you can with Anywhere Sim. As the UK’s first consumer multi network mobile operator, we enable you to use your mobile in more places around the UK than anyone else. It really is mobile without boundaries! 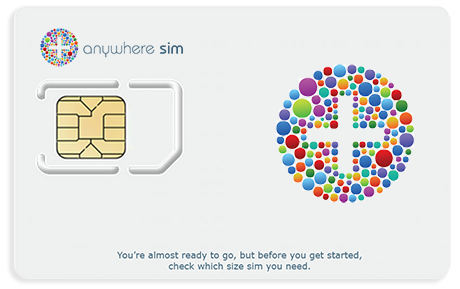 Anywhere Sim comes in two flavours, Pure & Plus. Pure is perfect for anyone who needs straightforward, transparent pricing & reliable mobile. Ideal for low users and people who simply need to stay in touch! Reliable mobile plus much more! Our Plus sim is designed for anyone who needs reliable mobile plus lots of inclusive value, like unlimited calls, unlimited sms and plenty of data! Now you can enjoy mobile without boundaries anywhere and anytime! Perfect for anyone who wants simple, straight forward pricing and mobile without boundaries! Perfect for anyone who needs unlimited calls, unlimited sms and lots of data, and of course, mobile without boundaries! Already have one of our sim cards ? We work hard to provide our customers with the best! Anywhere Sim’s connect to any available network, you can rest assured that you will always be connected whenever a network is available. Our UK based call centres look after your every need, from activating, to topping up, to simply requiring assistance. With the best coverage, industry leading customer service and one of the best value multi network mobile service. The choice is yours. Our Pure sim lets you roam seamlessly across Vodafone, EE & O2. The sim will let you access 2G & 3G frequencies across the UK & EU at one low rate per minute, per message and per MB. Calls are 10p per minute, SMS are 5p per message and Data is 10p per MB. Tops ups available from £10, £20, £30, £40, £50 or £60. Our Plus sim lets you roam seamlessly across Three, EE & O2. The sim will let you access 2G, 3G & 4G frequencies across the UK currently, but also the EU very soon. Each top up includes unlimited minutes, unlimited SMS and initially 4GB data, although we will be adding bigger data bundles soon. Top ups available are £30, £90 and £180.